Hi my name is Angela. I work with Dr Dot whenever possible. 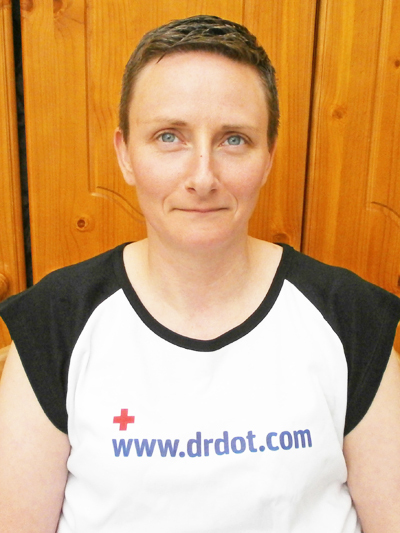 I am very proud to be part of Dr Dots internationally renowned massage team. I have trained in Swedish massage and Sports Massage to VTCT Diploma Level 3. I am also a Usui Reiki Master. I have a natural ability to get the right pressure and work to resolve tenderness and tension with as little fuss as possible. I am good at working on specific areas and full body massage. I work to exceed the client’s expectations. Taking pride in my work to give an invigorating or relaxing massage experience. I gladly work with anyone, at a time and place to suit. Traveling more than an hour away from base is no problem when I get my petrol paid. I really enjoy my job. I’m good at it too and if music is a part of it, that’s all I could wish for. If you like a job done well,,,, Pick Meee!!! Angela/ Birmingham and almost anywhere else.